Easy to install and remove; Taper bushings fit flush into taper bushing-bore sprockets (sold separately). To install, align the bushing and tighten the two included set screws to the recommended torque. The bushing contracts and wedges inward, gripping the shaft and bore. 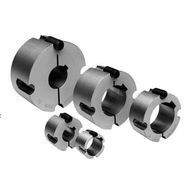 Sure-Grip QD taper bushings conform to the specifications set by the Mechanical Power Transmission Association. These easy-to-install bushing-bore sprockets give you the flexibility to use the same sprocket with different shaft diameters. Simply choose compatible QD tapered bushings (sold separately) with the bore sizes you need. Two cuts along tapered sides allow these taper bushings to expand for a tighter fit and greater leverage than other taper bushings. As you tighten the included cap screws, the bushing grips the shaft and pulls it into the sprocket or pulley. See shafting and keystock section to order. All taper bushings are steel and provided with a reversing thread for easy removal. For questions, please feel free to contact us.